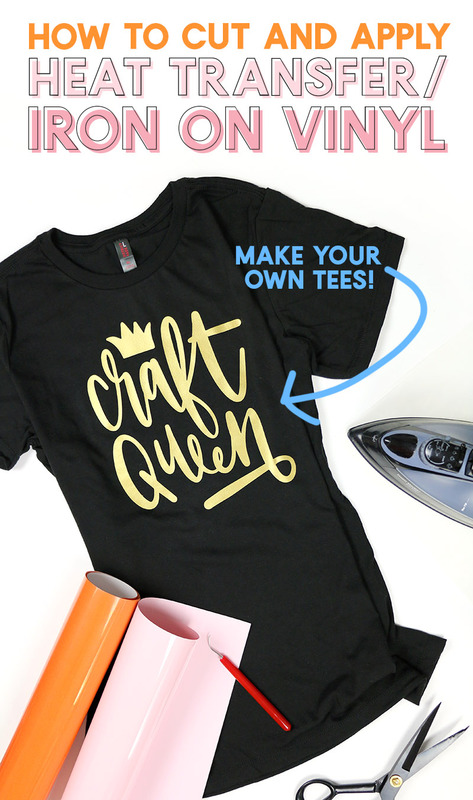 Learn how to make vinyl shirts, tote bags, and much more with iron on vinyl! 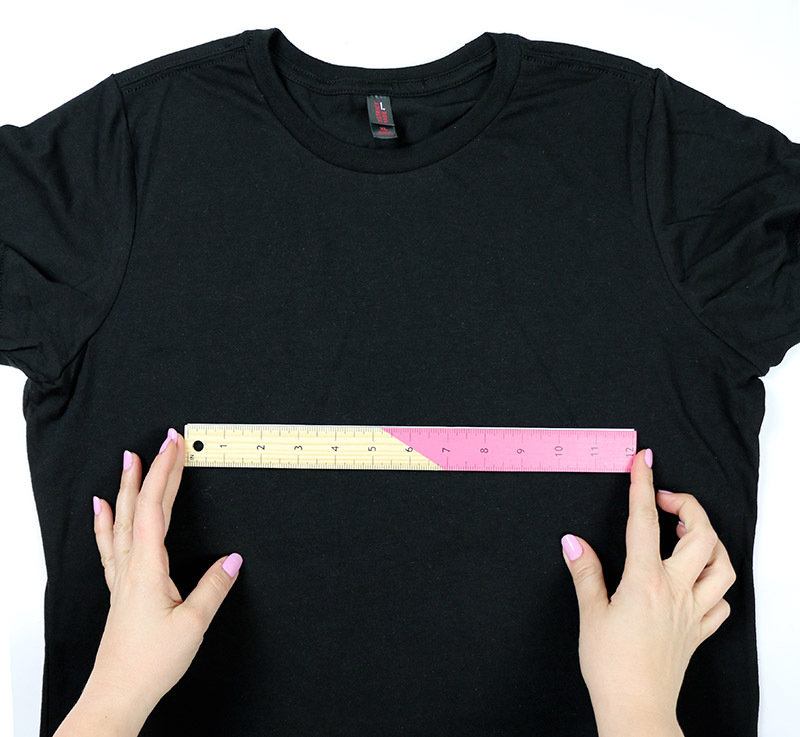 If you are new to working with vinyl, it can be a bit overwhelming, but this step-by-step guide will teach you exactly how to use heat transfer vinyl, and you will be making custom tees and more in no time! This post contains affiliate links, which help to support this site at no extra cost to you. If you are new to the world of working with heat transfer vinyl, then you are in the right place! This is my complete beginner’s guide to using heat transfer or iron on vinyl, and I am here to show you how to use heat transfer vinyl so you can start making! Heat transfer vinyl (aka HTV) is hands-down my favorite way to personalize gifts for friends. I mean, who doesn’t love a fun new t-shirt? And with heat transfer vinyl, you can easily customize it to be something personal that they will love. But iron on vinyl is not only good for t-shirts! You can use it on tote bags, leather notebooks, shoes, and even wood! 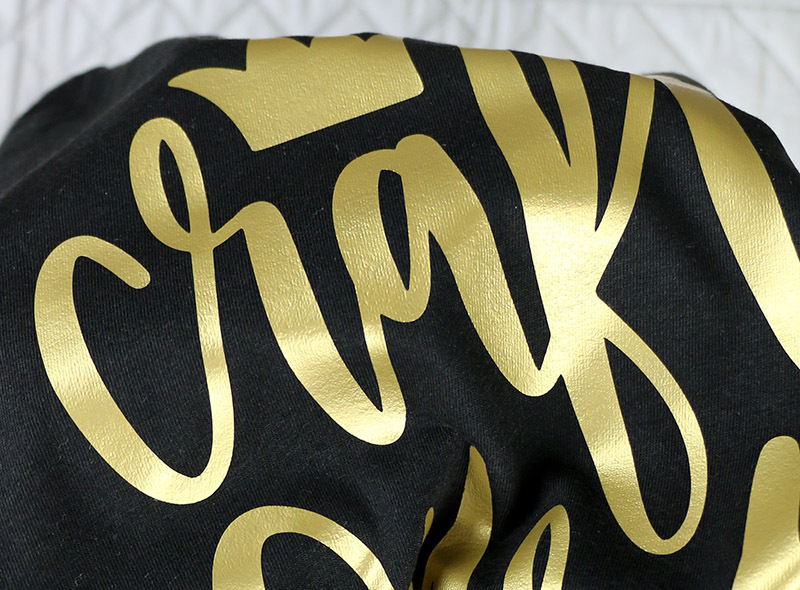 Ready to get crafting with heat transfer vinyl? Let’s do this! 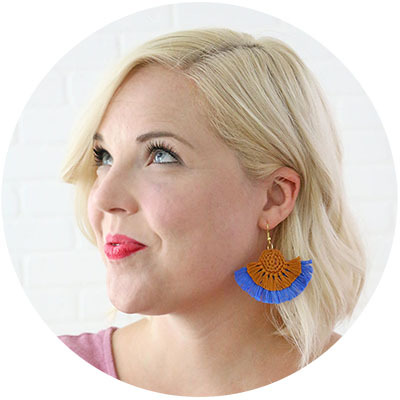 PSST – If you are brand new to crafting with vinyl, be sure to check out my Vinyl 101 page to find all of my vinyl resources for beginners. There are a few basic steps to working with heat transfer vinyl, and I will walk you through each one. They are preparing your cut file, cutting, weeding, and applying. That’s it! To walk you through the processing of making your own iron on vinyl projects, I am going to make myself a new t-shirt (yay!) 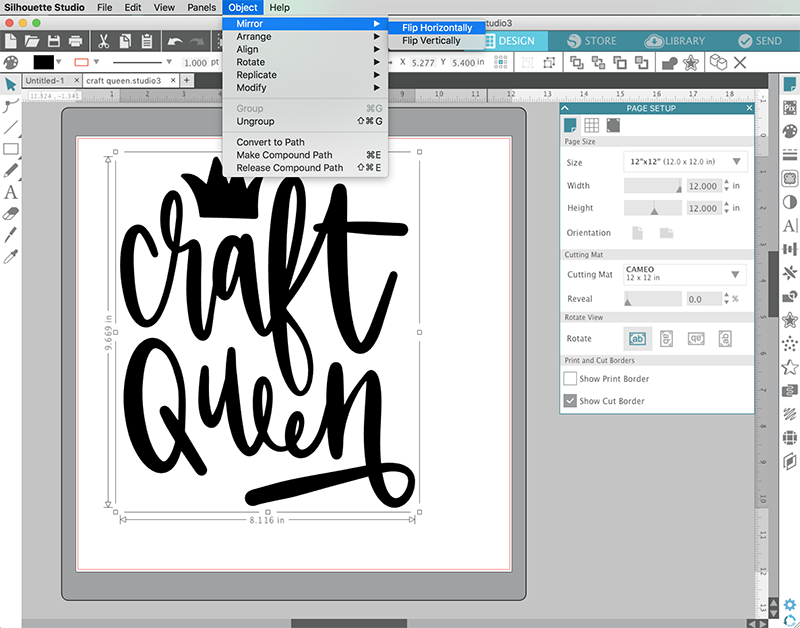 using my Craft Queen design that you can get over in my So Fontsy shop. If you are looking for cut files, then be sure to check out the free cut files I have here on the blog. I also have a cut file shop and participate in a monthly cut file bundle that you may want to check out. Finally, I am also regularly pinning cut files to my Silhouette board here. For this shirt, I used my Craft Queen design, which is available for purchase in my shop. Once you have your design and surface picked out, you need to measure your surface to determine how big you will need to cut the design. I am using a t-shirt that I got from Happy Crafters, which is a great little vinyl shop that also carries tons of awesome blank shirts just waiting to be vinyl-ed. I just used my ruler to get a general idea of how wide and tall I wanted to cut my design. I decided to cut it about 8 inches wide. Once you know how big you want to cut your design, open up the cut file in your cutting software. Next, you will need to scale the image to the right size. Just click on the design and then use the handles in the corners to scale it down to the size you want. Next, you need to mirror or flip your design horizontally. The reason that you need to mirror your design when working with heat transfer or iron on vinyl, you cut the design on the back side of the vinyl. HTV has a clear plastic carrier sheet that covers the top of the vinyl, and the other side is where the heat-sensitive adhesive is (it is not sticky or tacky to the touch). 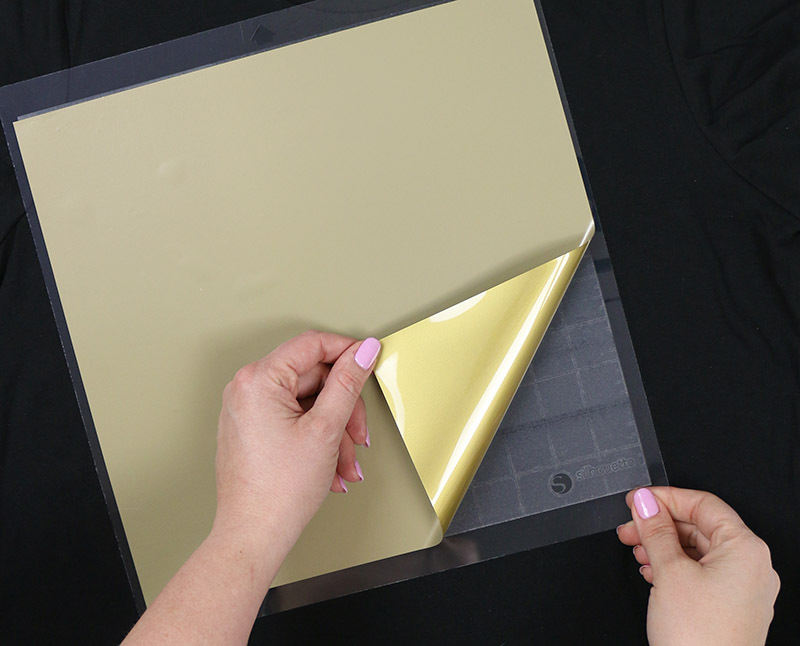 You cut your design on the adhesive side, and then the clear plastic sheet on the other side holds your design in place until it is applied to your shirt or other surface. So, to make sure our design looks right when it is applied to the final surface, we need to first mirror or flip the design before cutting. 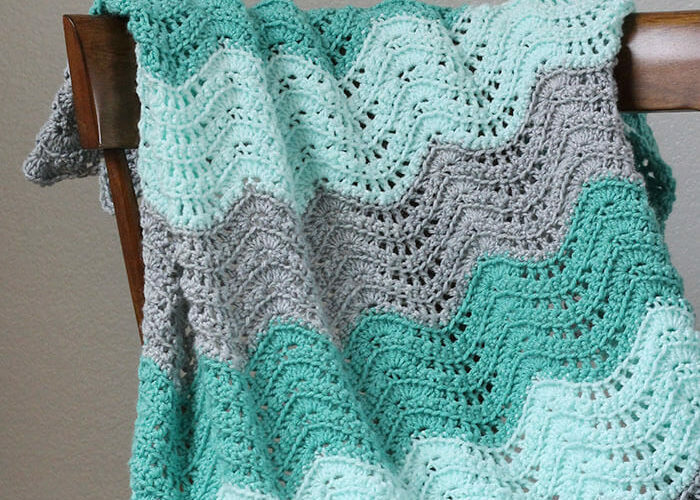 This is really simple to do with whatever machine you have. I will show you how to do it both in the Silhouette Studio software and in Cricut Design Space. To mirror the design in Silhouette Studio, click on the object to select it. Then, choose the Mirror option from the Object drop down menu and then select Flip Horizontally (see image below). 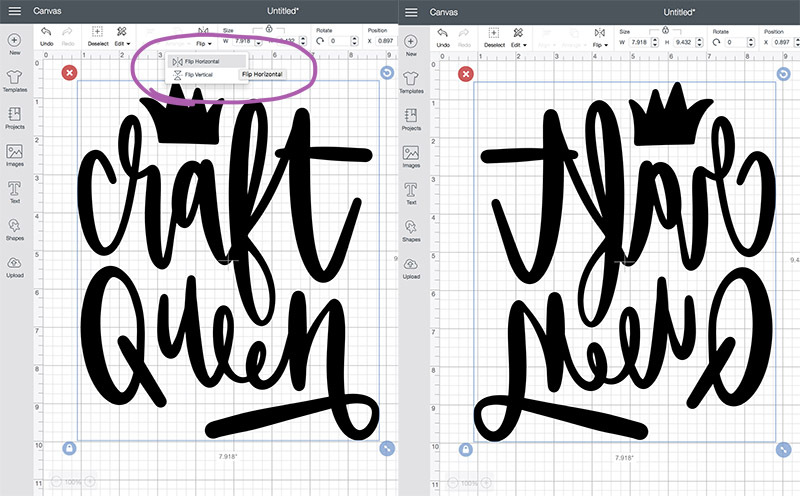 The process is really similar in Cricut Design Space. After uploading your design, select it, and then click Flip > Flip Horizontally (see image below). That’s it! Your design is now scaled and mirrored and all ready to cut. Now we are ready to load our heat transfer or iron on vinyl into the cutting machine. 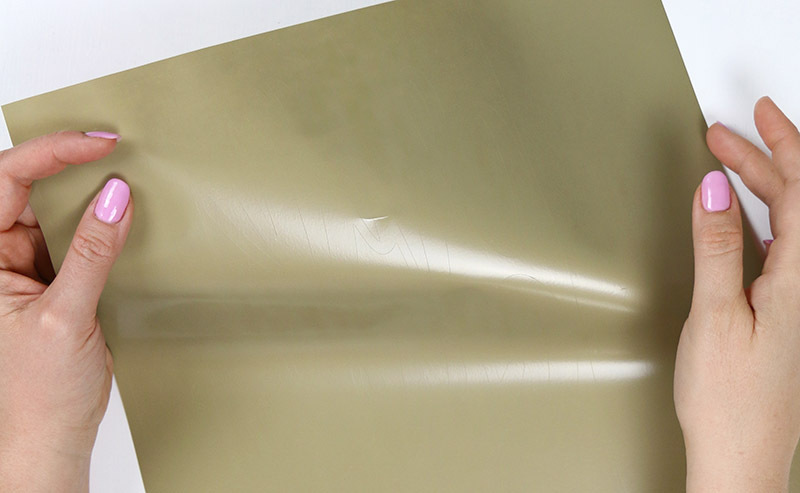 Whatever mat and machine you are using, put your HTV glossy side down onto your mat so you will be cutting on the matte side (see image below). Remember, we are cutting on back side of the vinyl where the heat-sensitive adhesive is. This side will be more matte. The glossy side of the vinyl is the side with the clear plastic backing. 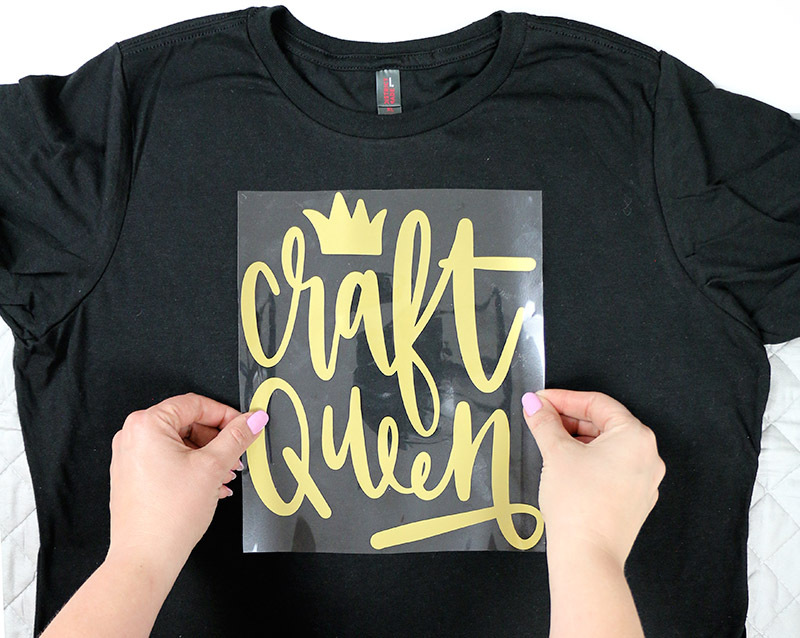 For my Craft Queen shirt I used a smooth gold HTV. If your vinyl came on a roll, you can cut off a piece to fit on your mat. Finally, adjust your cut settings to work with the material you are using. This process will be a little bit different for every cutting machine, but just make sure to choose the settings for the particular type of heat transfer vinyl you are using (flocked HTV will have very different settings from smooth HTV, for instance). Working with my Silhouette, I selected Heat Transfer Material, Smooth from the Materials menu. I recommend doing a small test cut, especially when you are working with a new material to make sure the cut settings will work well with the material you are using before attempting to cut the entire design. When you are happy with your cut settings, load your cutting mat with the vinyl shiny side down into your machine, and cut! The next step is called “weeding.” Basically, weeding just means removing any excess vinyl from around your design that you do not want to be transferred to your final product. To weed off the excess vinyl, you will need some kind of tool. I personally use, love, and recommend this weeding hook. It is sharp and works great for removing that vinyl. 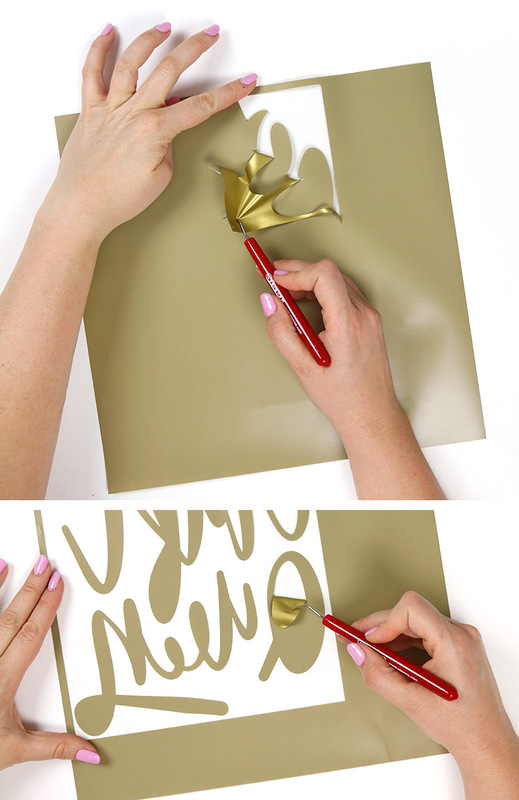 You can also use a Silhouette hook, a Cricut hook, tweezers, a craft knife, or even a straight pin. Sometimes it can be a little bit difficult to see your cut lines when weeding. Sometimes bending your vinyl a bit can help you see the cut lines like in the image below. You can also try holding the cut piece of vinyl up to a window or light to help you see the lines. There is also the option of the Cricut bright pad, which is designed to help you see cut lines to make weeding easier. Once you find your cut lines, use your hook or other weeding tool to grab one of the edges and lift up the excess vinyl or negative space from the carrier sheet. I like to start by removing the vinyl from around my design first and then remove the pieces from inside letters and other parts of the design. Once you have all the excess vinyl removed from your design, you can flip it over and see how your final design will look through the clear plastic carrier. This is a good time to make sure you have weeded everything you don’t want to transfer to your final project. Now we are all ready to transfer our cut and weeded design to our t-shirt! To activate the adhesive on the heat transfer vinyl, you need two things: heat and pressure, both of which we can get using an iron. If you use a lot of heat transfer vinyl, then you may want to get a heat press or Easy Press down the road, but for today we will just focus on using an iron. If possible, one that doesn’t have a bunch of big steam holes on the bottom will work best, but you can work with whatever you have at home. 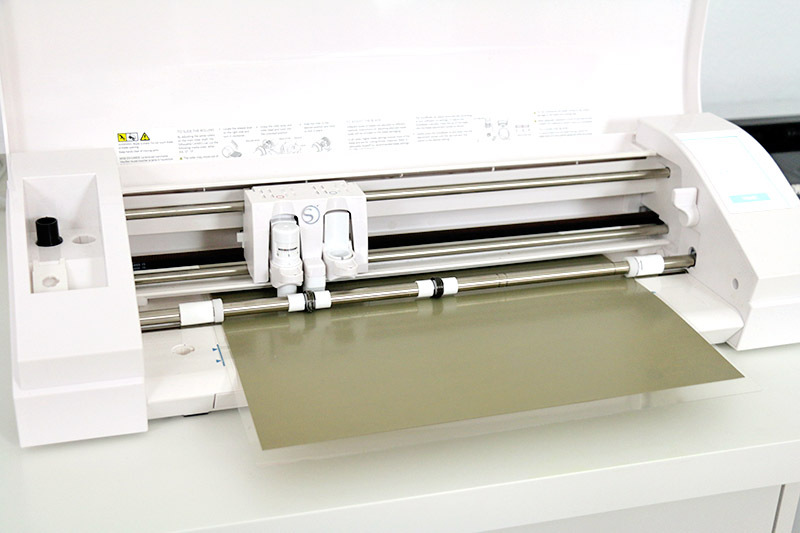 Because the heat transfer vinyl’s adhesive requires some pressure to activate, I recommend that you do not use a folding ironing board to apply your HTV designs. You don’t want to be pushing down on your ironing board and have it collapse beneath your pressure! To really get good pressure, I prefer to use an ironing pad like this one on a sturdy table instead of a folding ironing board. You can also try putting a wooden cutting board on your table. Start by plugging your iron in and putting it on the cotton setting with the steam turned off. Next, position your design on your surface with the clear plastic carrier sheet on top so the design reads correctly. I prefer to cover the plastic carrier sheet with a piece of parchment paper or thin cotton fabric. I find that this helps to protect my surface and keeps my vinyl from overheating or warping. Press down on your iron and apply pressure to each part of the design for around 10-20 seconds. Some types of HTV will require more or less heat and time, so be sure to check the instructions for the material you are using. I like to do a little bit of time, and then check the design to see how it is going. More time under the iron is not necessarily better as too much heat can melt the vinyl or ruin the adhesive. It’s also good to be aware of holes on the bottom of your iron. 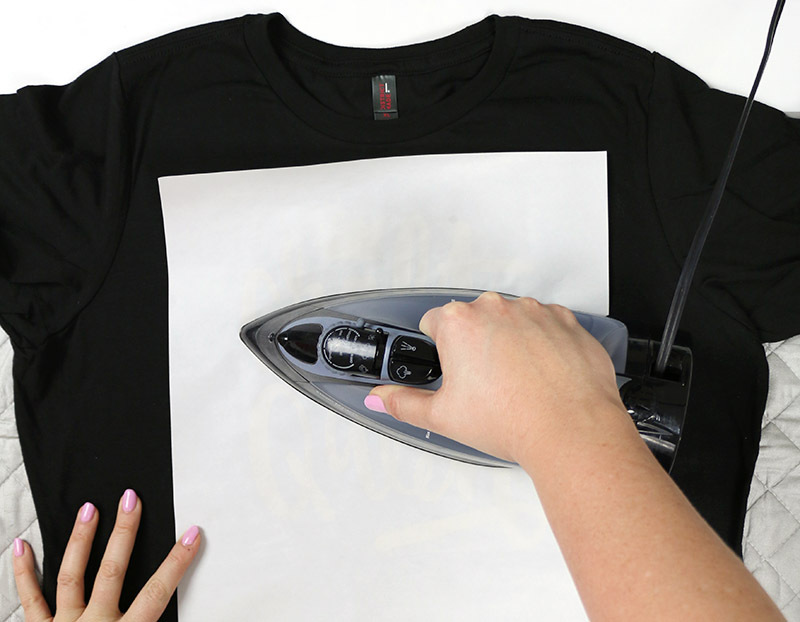 If your iron has holes on the bottom, be sure to move it around as you press to make sure each part of the design is getting heat and pressure. When you you have given heat and pressure to each part of the design, you can slowly start to peel up the carrier sheet. If the vinyl starts to come up with the carrier sheet, then you need to replace the carrier sheet and your cover sheet and give it some more heat and pressure. NOTE: Some types of heat transfer vinyl are “cold peel,” which means you must allow the vinyl to cool completely before removing the clear plastic sheet. After removing the plastic carrier sheet, I like to flip my project upside down or inside out and apply some more heat to the backside to ensure a really good application. With smooth heat transfer vinyl, you can see that you have a good application when you can see the weave of the fabric through the vinyl (see the image below). Once the iron on vinyl has been properly applied it is ready for wearing, using, and laundering. Allow the adhesive to cure for at least 24 hours before washing. Once it has cured, it can be washed and dried. For best results, wash inside out with cold water and hang to dry or tumble dry on low. And that’s it! Everything you need to know to make your very first HTV project! I hope this post was helpful for you. If you have any questions on how to use heat transfer vinyl, go ahead and drop them in the comments below. 🙂 And if you would like to see more in depth instruction on how to craft with vinyl and a Silhouette, you may want to check out my online course, Venture into Vinyl. Learn the knockout technique for layering heat transfer vinyl without extra thickness. Learn how to apply heat transfer vinyl to wood. Learn how to apply heat transfer vinyl to leather. If you would like to branch out into the world of adhesive vinyl and make your own DIY vinyl decals, be sure to check out my beginner’s guide on using adhesive vinyl right here. if you want to cut out vinyl by hand- no machine, do you have to cut a mirrored image for it too? If you are cutting with a pair of scissors, then you don’t have to mirror as long as you cut with the glossy side (the side with the clear carrier sheet) facing you, or with the design facing the right way when that glossy side is facing up. I hope that helps! I should maybe do a post all about cutting HTV by hand. 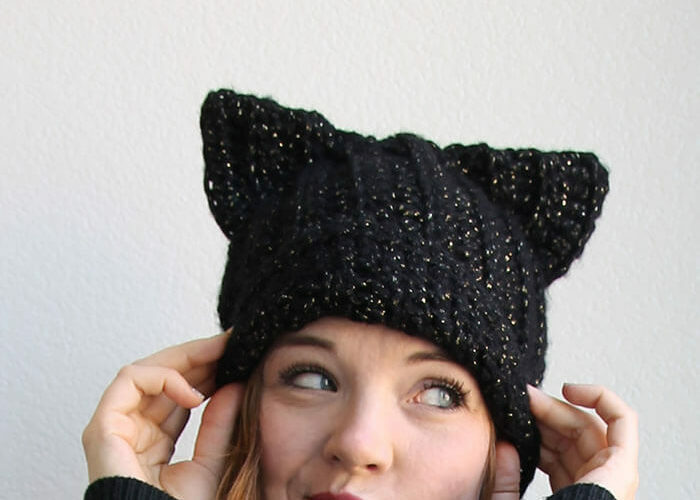 A post about cutting by hand would be great! Hi! Is there anything you can put on the back if you aren’t ironing it on immediately? I think a piece of parchment paper would work well for that.